We have reached the end of the Grange year and have held our annual session which wrapped up the programs and projects for the past year. Each committee reported on its accomplishments and many awards were given. The resolutions that the Granges have passed on to their Pomona’s and the State Grange have been voted on by the delegates. The resulting actions will now become State Grange Policies. I have read the resolutions and want to congratulate the many Granges who submitted them this year. We have more resolutions for this session than we have had in many years. Keep up the good work. At the annual session I reported on Legislative Committee activities for the year. The Legislative Committee has had a very successful year. Right after last session, the committee got together and rewrote the State Grange Legislative Handbook. We reformatted it into an easier to review booklet. Copies were handed out to the members of the General Assembly as well to all of the Granges. Gordon Gibson was our liaison in Hartford for the Connecticut Legislative Session. The Legislative Committee followed various bills as they passed through the General Assembly and Gordon communicated Granges views to appropriate parties. The Grange testified on 6 bills and followed many more. One of the major accomplishments for the agricultural community was the passage of the bonding bill which added an additional $10 million in bond authorization for farmland preservation. We also supported keeping the Connecticut Department of Agriculture as a separate agency. At one point the Governor recommended zeroing the budget for the Agricultural Experiment Station and the Grange wrote to the Governor requesting that he continue funding this station. The Legislative Committee assisted the Agricultural Committee with its booth at the annual Agricultural Day at the Capitol. Members of the Committee attended the Annual Plant Science Day that was held at Lockwood Farms in Hamden. This was sponsored by the Connecticut Agricultural Experiment Station. I also attended a couple of meetings of the Working Land Alliance where Gordon is a member of the Steering Committee. A highlight of the year was the Legislative Fly-In that was held in Washington, DC. We met with staff members from both Senator Blumenthal and Senator Lieberman’s offices as well as with Representative Lawson’s office. We had a personal meeting with Representative Joe Courtney and John Hollay, who is his Agricultural Legislative Assistant. Representative Courtney is a member of the Agricultural Committee in Washington so his willingness to meet with us was monumental. The Legislative Committee has expanded our presence by developing a Twitter page and has many non-grange followers. We also posted all of the testimonies that Gordon Gibson presented to the General Assembly on the State Grange’s web page. 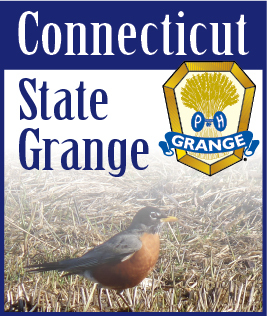 The Grange was mentioned in a few newspaper articles concerning our legislative positions. This new year will bring many more challenges. Please feel free to contact any member of the Legislative Committee for guidance with any legislative issues. Keep up the good work with those resolutions.